Design cards that meet the design constraints listed below. The entry I like best wins the competition, and there are runner-up prizes as well. Multiple entries are allowed, but please don't flood the contest, and multiple prizes can't be won by the same person. In addition to the listed prize, the first place winner gets to host the next contest, and they get to set their own design constraint and award prizes of their own choosing! It took a while to come up with something to play around with, but in the end, I decided to settle on this one. The design constraint for this week is: Create pet-based cards. 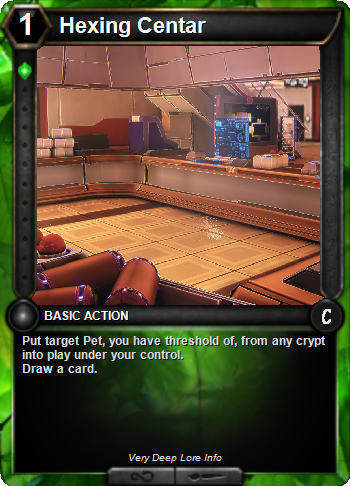 To clarify, a pet is a card that is summoned by another card, usually as part of a deploy effect. Examples include the Sly Huntress, Royal Den Mother and Shellsafe Sure Shot. Think big, I'd love to see some sort of coherent archetype coming together, like the way the Royal Den Mother grants all pets +1/+1! Mechanical Appeal: How much fun do I think I could have with a card like this? Is it mechanically interesting? Thematic Appeal: How 'cool' is the concept? Did you come up with a good name? Add some flavour text, for bonus points! Creativity: Sure, while "This summons two pets" fits the theme, it's not exactly a magnum opus. Don't be afraid to go big! 1st place: 1x Doombringer pack, 1x Dead of Winter pack, and first pick of the mercs. 2nd place: 1x Doombringer pack, and second pick of the mercs. 3rd place: Third pick of the mercs. Deadline is May 13th. I am on GMT, and I'll be on vacation by the time this contest ends, but I'll try and keep an eye on it and judge when I can! Good luck! My submission is a cycle of Bonds that will make a literal pet-a-palooza. Each Bond triggers off of a human entering play and then make the human bond with their respective pet. 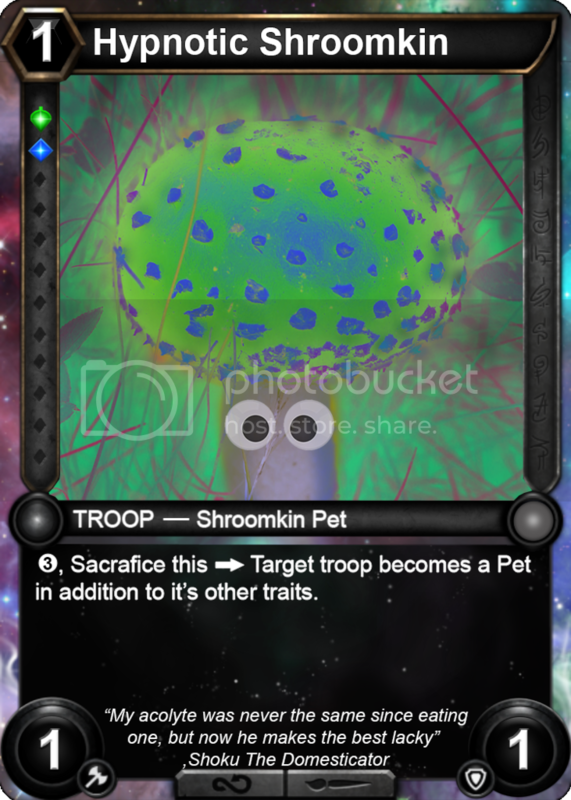 So in the case of the and bonds, the pets will be able to boost and protect your human troop. When you play a human, summon a Silver Talon Senator. That human becomes the master of the summoned pet. 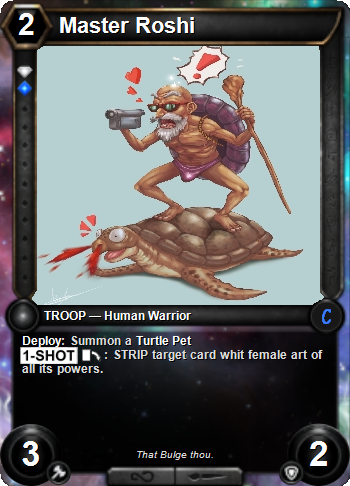 When you play a human, summon a Turtle Pet. That human becomes the master of the summoned pet. However, Bond of the Courageous gets particularly interesting in a dedicated pet deck. The power boost is worded to affect all pets that player controls. Royal Den Mother with equipment would be particularly terrifying. This looks fun, here is my submission. I really like competitions like this, so here is my submission. Maybe not the most complex design, but I hope you will like it. 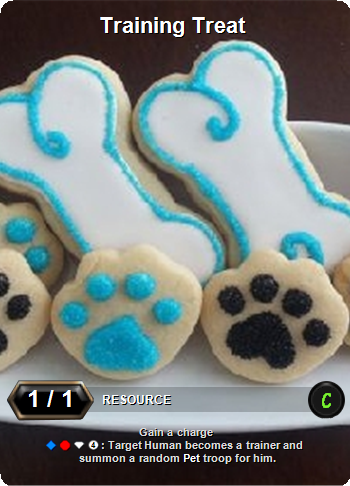 Meat Cleaver - Your Pets have : Deathcry : Create a Pet Treat and put it into your hand. The post was edited 1 time, last by cainhu ( May 11th 2018, 6:14am ). Ok took me a while to do this ^^. 1st one is Pokemon based as we cant talk about pets whitout including them and additionally i spend a lot of time making sure that it follows the theme, balance and has logic in it. 2nd one is a funny one but follows the theme and third one is a nice decent support card for Pet themed deck. The 1st three cards are a single card entry but i didn't want for you guys to read a lot of text so insted I made visual represenation for them. There you go. I hope ya guys like them. 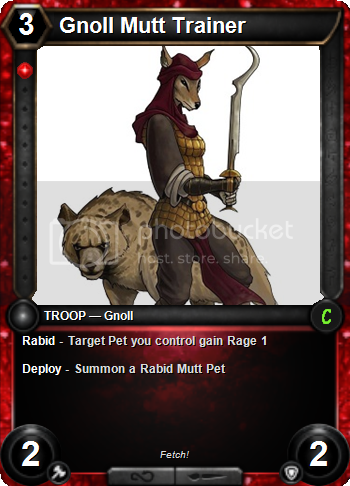 Deploy: Gain Control of target opposing troop, it gains the "pet" keyword. 3rd: @cainhu for the gnoll mutt trainer. Solid, basic design for a good common/uncommon level card! 2nd: @AvalonRoxy for Gonna Hex Them All. 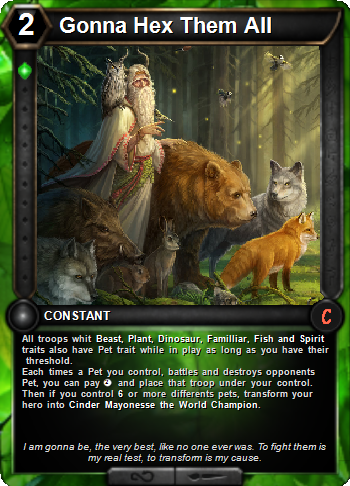 Though the thematic aspect of the cards is a bit too blunt, the gameplay does offer strong support for pet-based play. 1st: @Arcanyx for the bonds. 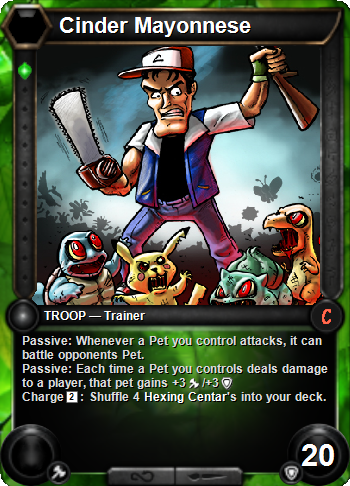 Strong gameplay aspect for human pet trainers. The stacking aspect of bond of the courageous allows it to escalate, too! Let me know which Mercs you want and I'll send them in as soon as I get access to a connection of more than 100 KB/s! Welcome back, mate! Hope you don't mind me snatching the next contest while you were away? ... no reason there can't be two at the same time, right...? Thanks @Firellius for running the contest. I'm waiting for the first two to choose a mercenary. @Firellius Shamrock would be my choice. Thanks for hosting the contest. And it looks like there is already even another contest posted. Arcanyx took Shamrock, AvalonRoxy took Sugarpuss, which would you like, @cainhu? I choose Quarkix. Thank you. It's nice that we have competitions like this. Of course, it would be better as something official. I sent out the rewards. Let me know if they arrived properly!